Use cheap Länder-Tickets for big savings on transportation on local buses and regional trains of Deutsche Bahn (German Railways) in Germany. Cheap Länder-Tickets (State Tickets) are often the best savings deal when sightseeing in a specific area of rural Germany. These cheap tickets are valid on local buses and regional trains of Deutsche Bahn (German Railways) and only for limited geographical areas. Fast intercity and other long-distance trains and buses may not be used. Usually, travel is restricted to one Land (or federal state) but if that limitation is not a problem, the savings on standard German train fares and tickets can be enormous. Germany has 16 federal states (Länder) but as some states are very small, only 13 different Länder-Tickets are sold as smaller states do not have their own Länder-Tickets. Länder-Tickets are much cheaper than standard railway fares so not surprisingly they do come with severe restrictions. Only German local and regional trains (Nahverkehr) may be used. Local buses, trams, and U-Bahn trains are usually, but not always, included as well. Only second class wagons may be used, although a few states now also have first class tickets. Local trains have the letters IRE, RE, RB, or S in the train name and number. U-Bahn trains in most cities are covered too. Länder-Tickets have time restrictions. On weekdays, Länder-Tickets may be used from 9 am to 3 am the following day, on weekends and vacation days from midnight to 3 am the following day. For journeys starting earlier, buy a ticket to the first station reached after 9 am and use the Länder-Ticket from there onwards. Even cheaper Night Tickets (Nacht-Tickets) are valid from 6 pm to the following morning 6 am (7 am on weekends). Up to five persons may travel on a Länder-Ticket. Some states have single tickets as well but for two traveling together, a standard Länder-Ticket is usually cheaper than two single-tickets. The person going to travel the furthest distance, or board earlier, should write his name on the front of the ticket. The group composition may not change so adding the names of the whole group on the back of the train ticket as well can help to avoid later disputes over group composition. Länder-Tickets are usually valid to the last station in the state but occasionally the first station in the bordering state is the limit. Similarly, when traveling from a bordering state, addition tickets need to be bought to / from the first station where the Länder-Ticket is valid. A dog larger than a domestic cat counts as a passenger – enter “Hund” rather than the animal’s name. Dogs cannot count as own children. Some states require a separate bicycle ticket. Länder-Tickets are usually available for single travelers or groups of up to five traveling together. The base price is for the solo traveler and then add a certain amount, e.g. €5 in Bavaria, for each additional traveler up to five. The prices differ slightly but are around €23 (€31) for a single traveler and €43 /€83) for a group of five in second class (first class). Baden-Württemberg-Tickets may be used in Baden-Württemberg as well as on trains to the Swiss cities Basel and Kreuzlingen. 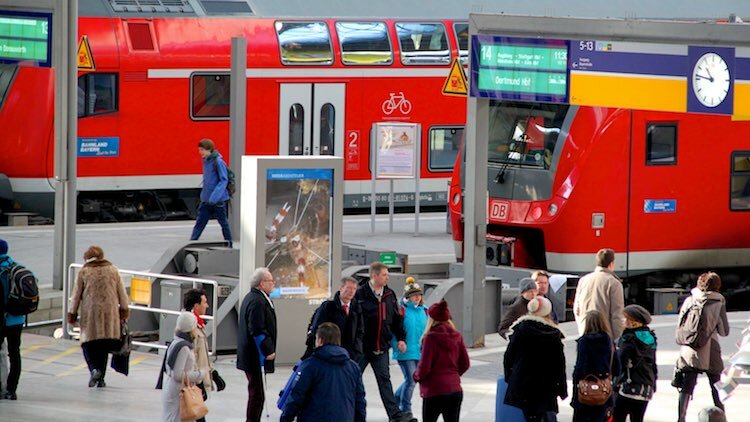 Bayern-Tickets are valid in Bavaria on all trains and on most city buses, trams, and U-Bahn trains as well. It is valid on trains up to Salzburg in Austria. Brandenburg-Berlin-Tickets are valid in Berlin (on all trains and buses), in the state of Brandenburg, as well as on some routes outside the state. (This includes traveling to Dessau and Lutherstadt-Wittenberg, popular day-trip destinations from Berlin.) For travel in the Berlin and Potsdam region only, cheaper Berlin Transportation tickets may be a better deal. Hessentickets are valid in the state Hesse including all trains, trams, and buses in Frankfurt am Main. Mecklenburg-Vorpommern-Tickets are valid in Mecklenburg-Vorpommern, Hamburg and Schleswig-Holstein. Niedersachsen-Tickets are valid in Lower Saxony, Bremen, and Hamburg. SchönerTagTickets NRW is valid in North-Rhine Westphalia. Rheinland-Pfalz-Tickets are valid in Rhineland-Palatinate and Saarland. Saarland-Tickets have the same conditions as the Rheinland-Pfalz-Ticket. Sachsen-Tickets are valid in Saxony, Saxony-Anhalt, and Thuringia. Sachsen-Anhalt-Tickets have the same conditions as the Sachsen-Ticket. Schleswig-Holstein-Tickets have the same conditions as the Mecklenburg-Vorpommern Ticket. Thüringen-Tickets have the same conditions as the Sachsen-Ticket. Travelers can save even more by buying the Länder-Tickets (or any German train ticket for that matter) from ticket machines or online from German Railways / Deutsche Bahn. Buying tickets from ticket counter windows at station usually have a service fee of €2 to €5. Tickets must be bought before boarding trains. When using only local trains on weekends, the very popular Schöne Wochenende Ticket (Happy Weekend Ticket) may be an even better savings deal, while the Quer-Durchs-Land day ticket allows for travel throughout Germany. In contrast to Länder-Tickets, the Schöne-Wochenende and Day Ticket for Germany is valid for travel nationwide. Many other savings options are available for traveling on German trains especially for advance reservations and return journeys.